Now that the first leg off the bear market bottom has been completed the mining shares have been consolidating for the last three weeks in preparation for another leg up, and I expect the second leg will be almost as powerful as the first. 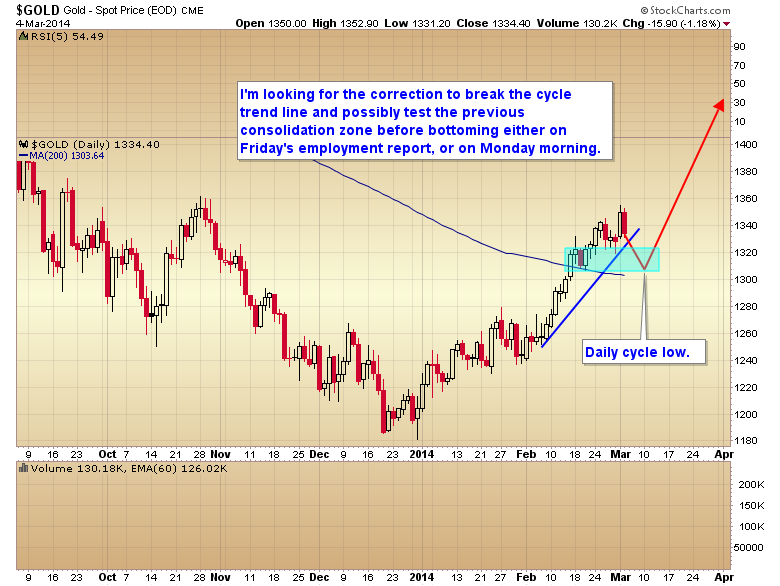 As gold is now late in its daily cycle I'm looking for one more dip down into Friday's employment report to complete the short-term correction. Then I look for gold's third daily cycle to test the $1,425 resistance zone over the next month. Over the next few days stocks should move up to test or more likely marginally break above $1,900 before settling into a consolidation as they await the next FOMC decision on March 19. As stocks settle into this consolidation phase buying pressure will move back into the commodity markets and drive gold aggressively out of the impending daily cycle low. Then when a third taper also fails to halt the slide in the U.D Dollar Index I look for a Mini Dollar panic during the second half of March that will drive a very powerful rally in commodities as they move toward an intermediate top. 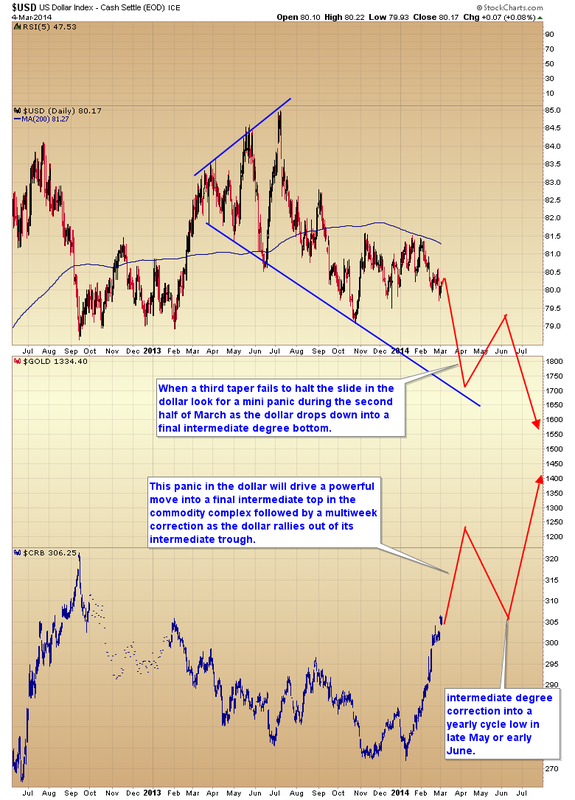 As gold rallies out of its impending daily cycle low, and especially during the dollar panic later this month, the mining shares should deliver a very powerful second leg up in this initial thrust out of their bear market bottom. 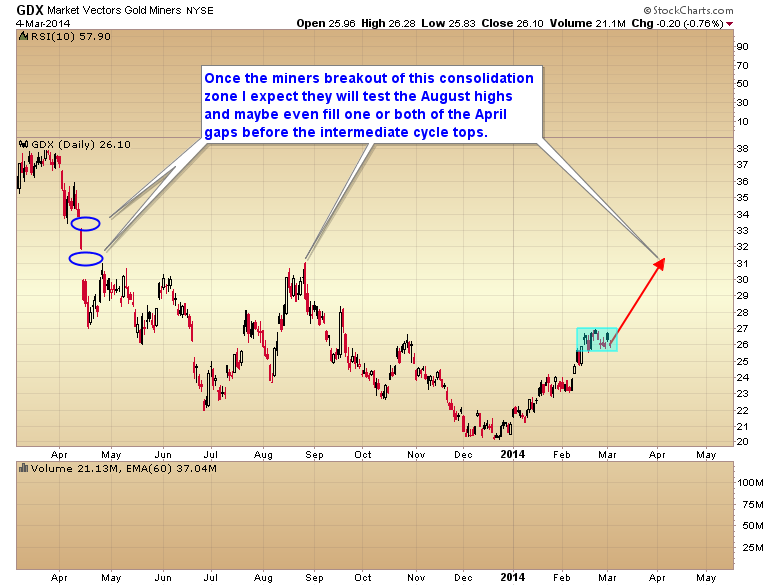 I expect GDX will at least test the August highs, and maybe even fill one or both of last April's gaps before the intermediate cycle tops sometime in early to mid-April. Traders need to enter initial positions before the close on Thursday, and if gold is down Friday morning after the employment report use the weakness to complete purchases as I think next week miners will break out of the consolidation zone and begin the second leg up of this brand-new bull market.